Brangelina monopolized the paparazzi. Vinnifer had the gossips geysering. The celebrity world gasped when Justeron (or Camberlake) split up. But if you want to know who's a real movie star, check out the latest Harris poll. It's weirder dish than you'll find in the Weekly World News. Last month, 1,147 U.S. adults were surveyed online by Harris Interactive and asked to name their favorite movie stars. The results were released Tuesday. Denzel Washington and Tom Hanks topped the list, which also included Will Smith, Johnny Depp and George Clooney. Nothing radical there, except that Pitt, Jolie and, oh, Tom Cruise were among the missing. The edge of weirdness comes with some of the other selections. Clint Eastwood, Julia Roberts and Mel Gibson make the top 10, though they haven't been seen on the big screen in several years. 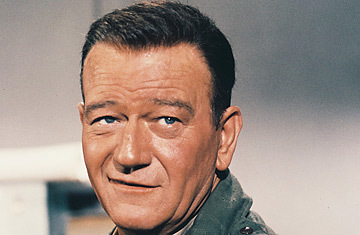 And the #3 movie star of 2006: John Wayne, who died in 1979. Here's where you begin to wonder if Americans think that film is a medium, or if they used a medium to contact the ghosts of celebrities past. And if so, where's Garbo? 1. Denzel Washington, 52, not in the top 10 last year. His 2006 films: Inside Man, which grossed $88.5 million at the domestic box office, and Deja Vu, a modest $52.5 million. 2. Tom Hanks, 50, #1 last year. His 2006 films: The Da Vinci Code, $217.5 million, plus a cameo in Cars, $244.1 million. 3. John Wayne, 99 if he were still alive, tied for #3 last year. His final film: The Shootist in 1976. 4. Clint Eastwood, 75, #6 last year. Most recent on-screen role: Million Dollar Baby in 2004. 5. Will Smith, 38, first time in the list. His 2006 film: The Pursuit of Happyness, $138.7 million so far and still going strong. Tied for 5. Julia Roberts, 39, #5 last year. Most recent on-screen role: Ocean's Twelve in 2004. 7. Johnny Depp, 43, #2 last year. His 2006 film: Pirates of the Caribbean: Dead Man's Chest, $423 million. Tied for 7. Mel Gibson, 51, #7 last year. Most recent on-screen role: The Singing Detective in 2003. 9. George Clooney, 45, #8 last year. His 2006 film: The Good German, and yes, you're reading this right, so far it's earned only $767,618. 10. Harrison Ford, 64, #3 last year. His 2006 film: Firewall, $48.7 million. What to infer from these rankings? That Americans will pay to see Will Ferrell (Talladega Nights) or Adam Sandler (Click) or Ben Stiller (Night at the Museum) in a certain kind of comedy  and Cruise can get their attention by testing the tensile strength of Oprah's couch  but somehow these guys don't fit the image of movie star. The Harris poll suggests the yen for a platonic ideal: the humane man (Washington, Hanks, Smith), or the tough hombre (Wayne, Eastwood, Gibson, Ford), or the matinee idol (Depp, Clooney) or the pretty woman (Roberts). These are not just people we want to watch, says the poll, but people we want to be. It matters not whether he or she has appeared in a movie since, say, Barack Obama was elected to the Senate. Indeed, of the Harris 10, Smith and Depp are the only two who are under 50 and had a hit movie last year. Depp fronted only the third movie in history to earn more than a billion dollars at the worldwide box office, and he dropped from #2 to a seventh-place tie. Clooney can star in and direct politico-art movies, like Syriana and Good Night, and Good Luck, and be an outspoken liberal just ahead of the Iraq-fatigue curve, yet he stays more or less in the same slot over three years. And Gibson? Though his highest-profile public role in 2006 was as a raving drunk, and his sound man was a cop, Mel is in seventh place, same as last year. The Americans polled seem to have short-term memory loss. Or else they abide by the maxim: It's not who you are, but who you used to play. They like Mel, and a few anti-Jewish lunacies haven't eradicated their affection. Forget the youthquake. What America really loves is... old. Whatever Wayne represents  the Old Testament God, a Mount Rushmore face with a permanent scowl, the craggy soul of Frontier or Sunbelt America  he has made the list in each of the Harris poll's 13 years, and he's figured in the top three slots eight times. It's as if the People's Choice Awards kept picking Elvis as favorite singer. Even dropping Wayne out of the equation, the average age of the stars is 51. Which raises the question: is movie star quality a finite resource, like oil, and did Hollywood spend it all in the days of the Duke, the King (Clark Gable) and other charismatic royalty like Humphrey Bogart, Bette Davis, Audrey Hepburn, Burt Lancaster, dozens, hundreds of others? Even in their particulars of age and political preference, the data are peculiar. Liberals and moderates go for Washington (not Clooney? ), while conservatives prefer Wayne and, whoa, Hanks (not Mel?). Agewise, Wayne is #1 with the baby boomers; but Roberts wins the hearts of the AARP set, which you might have thought the Duke would own. Will Hollywood take any lessons from this poll  say, to make movies with, and for, older people. Nah. The moguls have read the small print in the Harris poll, and noted that it was weighted for many variables, but not to mirror the average age of moviegoers. Its respondents were all 18 and over. And that is, pretty much, a demographic the studios ignore. Hollywood takes its own poll every weekend, at the box office, and there the kids, as they have been for 30 years, are #1.